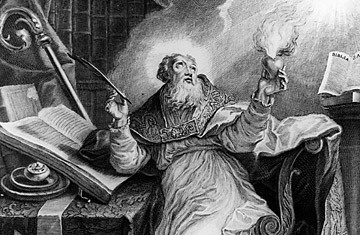 Was Saint Augustine Good for the Jews? St. Augustine of Hippo (354-430) was probably the most influential Christian thinker after the Gospel writers and St. Paul. It is to him that we owe such doctrines as original sin and predestination. Yet he has traditionally been unpopular with those concerned about Christian treatment of Jews over the centuries, a disapproval that was expressed eight years ago by the popular historian James Carroll in his much read book Constantine's Sword. Carroll wrote that Augustine and his followers believed that Jews "must be allowed to survive, but never to thrive" so that their public misery would broadcast their "proper punishments for their refusal to recognize the truth of the Church's claims." And the rest, goes the claim, was bloody history. But in a new book, Augustine and the Jews, Paula Fredriksen, a Boston University religion professor and self-proclaimed "Augustinista," upends the received wisdom. Fredriksen is no coddler of anti-Judaism. A former Catholic who long ago converted to Judaism, she was one of Mel Gibson's most acerbic critics when he released his movie The Passion of the Christ. But her book's subtitle, "A Christian Defense of Jews and Judaism," describes what she contends was Augustine's actual stance on the topic, one she says was "was little short of revolutionary"  in a good way. Excerpts from David Van Biema's interview with Fredriksen. TIME: So Augustine is not the bad guy regarding the Jews that historians so often conjure? Fredriksen: Let's say that Augustine was much more benign socially  at least toward Jews  than people have usually thought. What caused you to question the received wisdom? Back in 1993, I was reading a work of Augustine's attacking a Christian heretic. Usually when ancient orthodox Christians said terrible things about heretics, they found even worse things to say about Jews. Until 395, Augustine had not been much different, but here he was, writing about one of the flashiest heresies of his time and marshaling as arguments unbelievably positive things about Jews. As I read further, my scalp tingled. I had been working on Augustine for 20 years and I'd never seen anything like this before. Not only could I establish that he had changed his position, but I could locate this shift in his thinking very precisely, to the four-year period when he also wrote his monumental Confessions. He just flip-flopped on the topic? It was more complicated. Imagine if all our public discourse was conducted in the language of legal combat. His was. Learned argument did not aim to represent an opponent's position fairly, but to make it look as ridiculous as possible. Part of his rhetoric regarding Jews reflected this. Also, Christians using harsh language against Jews were often actually aiming at Christian opponents, whom they painted as darkly as possible by comparing them to hostile caricatures of Jews. So when Augustine used such language, he meant nothing by it? He could mean many things by it, but often he's dealing in what you might call "rhetorical Jews" rather than real Jews. It's also important to remember that for much of Augustine's lifetime Jews were Roman citizens with the rights of citizens. This begins to change in the late fourth century, when the Emperor decides to link government closely with one particular form of Christianity  a big faith-based initiative. But the real social disenfranchisement of Jews occurred long after Augustine. Medieval persecutions and  much later  the Holocaust, were not events that Augustine could have imagined. But still, his words helped shape that history, even if as an unintended consequence. Yes. I hear my mother's voice echoing in my head: "If you can't say something nice, don't say anything at all!" Even some of the milder things he said had terrible consequences. There is a verse in Psalms, "bend down their backs always," that he, reading Paul, applied to the Jews. He meant by this phrase that when Jews read the Bible, their posture was oriented "downward" toward this world rather than "upward" toward heaven. Much later, churchmen will misinterpret Augustine to be saying "Sit on Jewish backs until they bend." The things that were later done on his authority were a horrifying misreading. And he himself would have been horrified. There are two kinds of evidence. First, from his life. Recently we've recovered a nice little memo of his to a fellow bishop on behalf of a plaintiff, telling that bishop to get his sticky fingers off this guy's property. The plaintiff whose side he takes is a Jew, and Augustine even quotes St. Paul to the effect of not creating a scandal "in front of the Jews." But more important is the theological 180-degree turn Augustine does between 395 and 398. He has moved from demeaning Jews and disparaging Judaism to becoming the only theologian of his era to make them an important and positive part of his view of God and humanity. Well, modern Christians take it for granted that Christ really had a fleshly body. Not all ancient Christians agreed. Augustine, in the course of arguing for Christ's incarnation  this intimate relationship between divinity and humanity  explicitly parallels it to God's relationship with the Jews. He writes that Catholics and Jews stand as one community over against pagans and heretics, that Jesus and his apostles, including Paul, lived as Torah-observant Jews for the whole of their lives. And he urges that God himself would punish any king who tried to interfere with the Jews' practice of Judaism. These ideas preserved space for Jewishness in Christian culture, space that in the much more toxic culture of the Christian Middle Ages, helped save Jewish lives. Although that, too, was an unintended consequence. He could not possibly have imagined their being in that kind of danger. What about the impression that although Augustine said that Christians "should not kill" Jews he still wanted them to be miserable  to "survive but not thrive"  as an example of what happens to people who do not accept Christ? "Do not kill them" is from Psalm 59, which Augustine uses to argue that Christians should not "kill" the Jews' Jewish traditions because they come from God. He believes that God himself maintained the Jews' existence as a people because their devotion to the Torah broadcast the antiquity and authenticity of the Jewish Bible, which Augustine held contained prophecies of Christ. So yes, he thought the Jews should survive. The "But not thrive" line is a non-Augustinian addition of a later period. If your deconstruction of the received view of Augustine on the Jews is so new, do you think it will be controversial among scholars? I don't know. Scholarship in this general area is changing. In the past 50 years, so much archaeological evidence has appeared that suggests positive Jewish/Gentile relations during Augustine's period and after. The ground has been laid for revision. Does your history of Augustine and the Jews have any relevance for modern Christians and Jews? I think so. In a fairly dark history of Christian-Jewish relations, his theology turns out to be one of very few bright lights. All of these ancient Christian-Jewish interactions are more complex and interesting than are the received ideas about them. Our lives are still shaped by this history, so it's important to get it right. And if modern Jews and Christians, attempting interfaith dialogue, find in Augustine a precedent for common ground, that would make me really happy. It would be an unintended consequence of my book. But a good one.